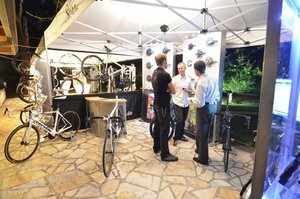 In celebration of the UCI Road World Championships in Tuscany, SRM Italia hosted an evening industry event in partnership with FSA on Thursday September 26th. L'Esclusiva World Championships Reception was held at the SRM Headquarters, an exquisite cycling themed villa, in the city of Lucca. Guests included members of national cycling federations, professional cyclists, team management and staff, industry partners, as well as local and cycling media representatives. The event was centered around an SRM and FSA product showcase accompanied by Italy's finest food, wine, and music. *Pictures shown are for illustration purpose only.Actual product may vary due to product enhancement.